The other day I drove over to the local farmstead to buy some sweet corn for dinner. While I was selecting my ears and putting them in a bag, another man stopped to also buy corn. He looked familiar, but I couldn’t place him. He was a local man who obviously recognized me. He had the advantage there. He shook his head, so I told him the story. Not many people know it. When I was growing up, we used to sell sweet corn. I think it started as a way to give my sibling and me a little income and some responsibility. Through the 70s, we all worked at it. Even after we were grown, it continued, although I’m not sure how. These photos are from a vacation Bud and I took to Cooperstown in 1984. 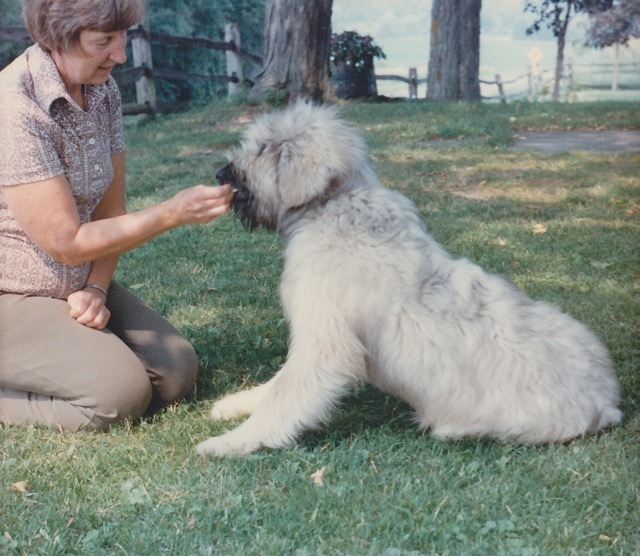 At the time, my parents had a beautiful dog, a Briard named Natalie Bumpeaux. 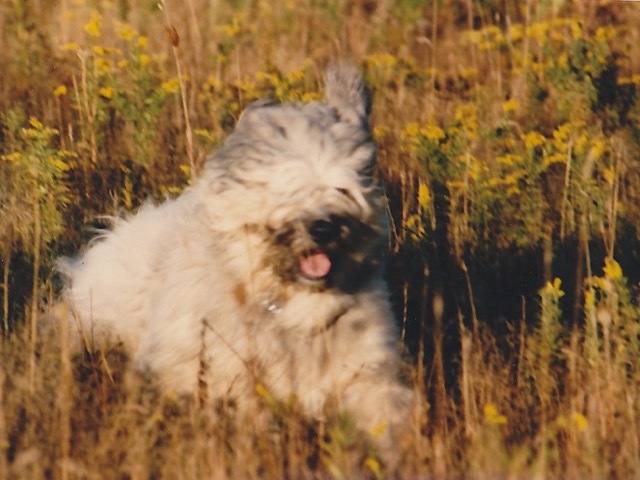 Natalie had the goofy good looks of a sheepdog, but also the protective nature of a working dog. She loved my mom and tolerated the rest of the family. 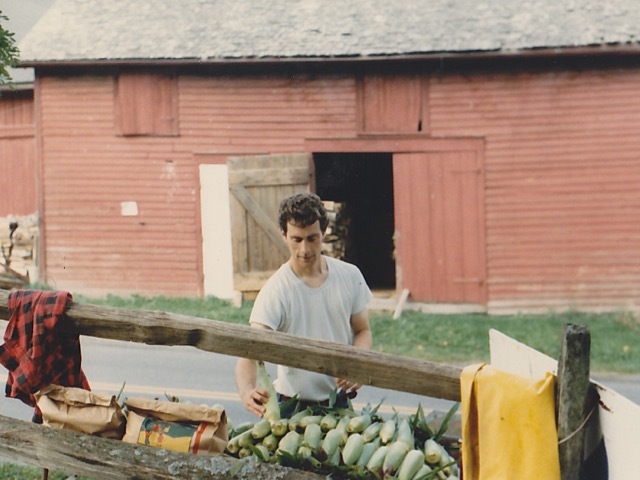 In the early 90s, a woman stopped to get corn from the table, but there were no bags, so she walked up the driveway and onto the side porch. She looked around and found a bag. When she headed back to the corn table, Natalie ran up behind her and bit her in the calf. My mother heard her yelling and came out to see what was happening. The woman told her that the dog had bitten her. My mother offered to take her to the hospital, or call, or make sure she was properly cared for. My mother was, after all, a nurse. The woman insisted she was fine and left. Later that evening we were at the emergency room with one of our boys. We saw the woman who had been bitten — Bud recognized her because he had been out at the house when it happened — and she was in agony. She was limping around the waiting room and loudly complaining to anyone who would listen. She wouldn’t sit and put her leg up. She was on parade. We called my parents and told them she was at the ER. They again offered to cover any bills. Fast forward a month or two, the sheriff pulled up to the house. It was a notice that my parents were being sued. I have to remind myself that she wasn’t really a local. They had a local summer-house, but weren’t invested in the community. Neighbors just don’t do that. My parents’ homeowner’s insurance took care of it, so I don’t know the exact outcome. But it ended the corn business and left our family feeling gut-punched. Natalie went to live on a farm that was more isolated than where my parents live, and with people who knew and understood Briards. On the road of life, the incident was only a pothole. And, honestly, it was nice to be recognized and kindly remembered by someone buying corn the other day. I remember eating corn from your field. Delicious!! 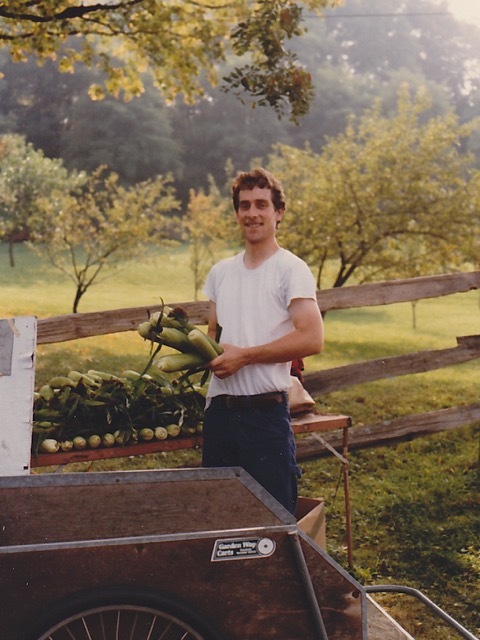 I think everyone in Cooperstown bought our corn — except the Ingalls, of course. What a great peek back into the past. Of course it would be nicer without the nasty lawsuit – especially when your mom had offered, more than once, to cover any expenses. People! I still enjoyed the story and the memories. Thanks — I enjoyed my little trip down memory lane too — or should I say into memory’s cornfield? I guess this is a Corn Dog Tale. Bittersweet rememberings so beautifully told. Yours is a gift. It’s funny — the sugars in corn start breaking down as soon as the ear is removed from the stalk, so old corn is not sweet. For years this was not a sweet tale. Not even bittersweet, just bitter — so I put it in a box and shoved it into the dark recesses of my mental attic. When the man at the farmstead pulled it out of its hiding place the other day, I found that it was quite sweet. Far more sweet than bitter, anyway. It sounds like that woman was thoroughly unpleasant and unreasonable- and something of a drama queen. I always worry that one of my dogs will be loose when a stranger drives up unexpectedly and they will nip at their heels as they sometimes do when they get excited. They have never really bitten down, just made themselves known but to some people it would seem like a really big deal.